The RPM is a great event to be involved in. If you are on the land rather than on the water it can still genuinely be fun and it is a great spectator event. Some landcrew and supporters say it is a life changing experience. Although others are not so amused by the many requests from their paddlers. Either way it is very important for paddlers to have supportive land crew. The responsibilities of land crews extend far beyond just driving the vehicle from the start to finish each day. The RPM is a demanding event in the middle of winter so it is important that those supporting participants are prepared for all eventualities including cold, rain, wind, blisters, dehydration, even heat and sun. If you are new to the event ask at registration to“buddy” with someone. There are lots of people who are willing to help. * Be prepared, read the information on hypothermia and be aware of any special medical condition which might affect your paddler. * Listen to the race briefings each day, some of the information is for land crew. Make sure your paddler is aware of any changed conditions. * Be at the start on time and make sure you are at the finish with dry clothes when your paddler is due to arrive. Most of all stay warm and have fun. It is a great event and you will quite likely make lifetime friends. Plant quarantine restrictions apply throughout Australia. A national border protection network operates at road entry points into the Riverland. Plant Health Inspectors, Australian Quarantine and Inspection Service (AQIS) Officers and detector dogs may be encountered at these entry points. Do not take fruit (including capsicum, chillies, tomatoes, cucumber, zucchini and squash) into the Fruit Fly Exclusion Zone (FFEZ). Choosing the right accommodation is part of making the RPM a great experience. Being in the action suits some partcipants. Some like to take the 5 star option, while still others will string a hammock between two trees and sleep there. Regardless of your personal preferences you should remember that accomodation in the Riverland is normally pretty tight over the June long weekend. 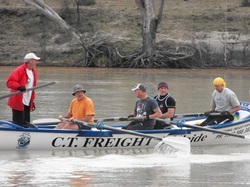 Apart from the RPM there is often golfing tournaments going on and the annual Riverland Country Music Festival. The following options are just some ideas for your RPM accommodation. There is free or low cost camping available at or close to each of the start and finish points along the river each day, e.g. 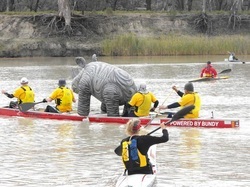 Last minute bookings can also be made at www.wotif.com.au by just typing Riverland (SA) into the search criteria.